This article provides helpful information for you to discover if your child is struggling with receptive and expressive language challenges. For language development delays, click here. Integrated Learning Strategies (ILS) is a learning and academic center. As a reminder, ILS is not a health care provider and none of our materials or services provide a diagnosis or treatment of a specific condition or learning challenge you may see in your child or student. If you seek a diagnosis or treatment for your child or student, please contact a trained professional who can provide an evaluation of the child. As you may have read in our previous article, language delays are different from speech issues your child may experience and it’s important to know if they are struggling with one or the other or both. While speech delays are often related to how your child pronounces words or annunciates their sounds and letters, language is developed into two parts: receptive and expressive. Language = Ways children and adults express themselves through words, writing, signing or other gestures (expressive), or how they receive, comprehend and understand questions (receptive). Speech = Pitch, loudness and quality of your child’s speech when using the muscles of the lips, tongue and jaw. 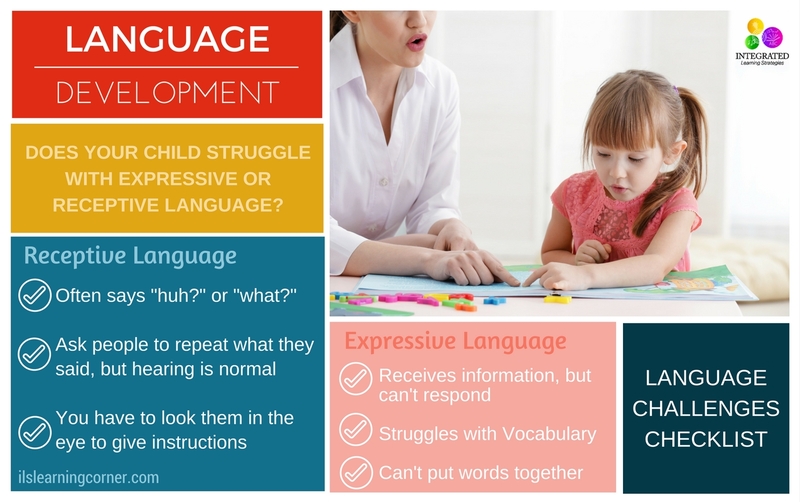 So how do you know if your child has extra challenges with language development? What challenges may your child face with expressive and receptive language? 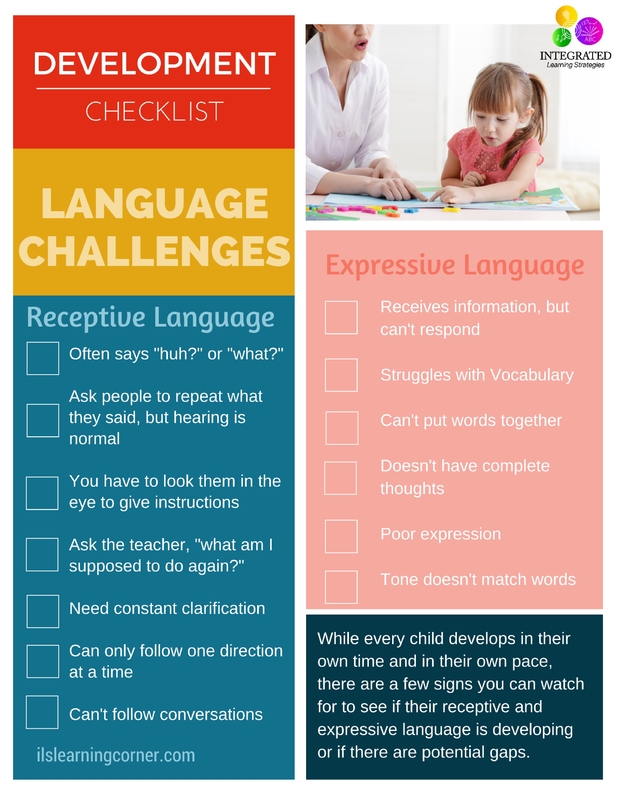 Print a copy of the language challenges checklist at the bottom of this article. Discovering challenges in your child’s expressive and receptive language development is not hard to find if you know what you are looking for in your child. 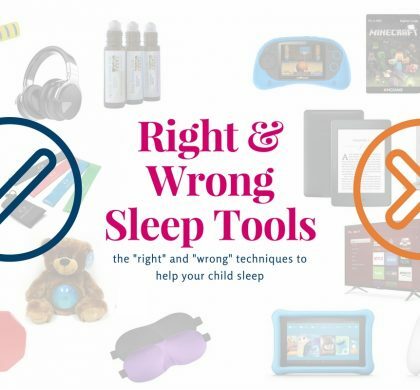 Many parents and teachers have identified a few things that showed their children or students were struggling. Some of these challenges can help you determine if your child needs additional help from a professional or if they will eventually catchup with their peers. If you suspect your child has challenges with their expressive and receptive language, here are a few signs and a helpful checklist for you to determine if there are learning development gaps. Children will often say “huh” or “what” when parents are talking to them. Sometimes parents can’t tell what was received (receptive language) by what their child says. Children ask people to repeat what they just said as if they didn’t hear, yet when parents take them to the doctor their hearing is just fine. Children struggle with vocabulary and putting words together to form complete thought. Parents often need to look them in the eye and talk to them—in other words parents can’t yell to the children across the room and ask them to do something. The expression of the child’s voice when speaking doesn’t always match the words they’re using. In the classroom, right after the teacher has given instructions, the child is either at her desk saying, “What am I supposed to do again?” or they ask their peers what they are supposed to do. A child may understand what you say, but sometimes looks confused when you ask them what they want. For example, he may say, “I can’t do that” when he means, “I don’t want that.” Some parents have to work with their child to understand how to express the difference between wanting something and needing help doing something. They need constant repetition or clarification. Sometimes parents have to say things in a different way to help their children understand. Your child visibly struggles to communicate what they want. They know what they want, but you can tell by their frustration, they cannot express it clearly. It can cut them off from relationships with others because they have a hard time following conversations. Should I worry about my Child’s Language Development? Delays in speech and language are the most common types of developmental delays in children. One out of five children experience a delay in using or understanding words when compared to other children. Remember, you know your child best. Just because a child struggles doesn’t mean that child can’t catch up or get help. It doesn’t always mean a child needs help – maybe your child just needs a little more time, but don’t be afraid to ask for help for your child. A general speech and language delay is the most common cause of a child’s speech and language delay. Children with this type of delay often learn at a slower pace than other children his or her age. It is most likely a temporary situation and can be resolved with some speech therapy and at-home activities. Children who eventually develop speech and language skills can quickly catch up to their peers. Hearing loss can occur before or after speech and language development. Children who experience hearing loss are often delayed in speech and language comprehension and require professionals to help with alternative language training, music therapy and in some cases, hearing aids. Many children within the Autism Spectrum (ASD) also experience delays in speech and language. Typically, children have trouble communicating effectively and for long periods of time. Expressing thoughts and feelings, social situations and acceptable social behaviors are often difficult for these types of children. Autism specialists, Occupational Therapists, Pediatric Therapists or movement and music specialists can work with the child to improve speech, language and social skills. We have found music therapy to be one of the most effective methods for building speech and language in children with high-functioning autism. Students with autism, who were also non-verbal or who experienced speech and language delays, showed vast improvements with these types of interventions. An Auditory Processing Disorder (APD) describes a problem with decoding speech sounds, which affects the child’s receptive language. 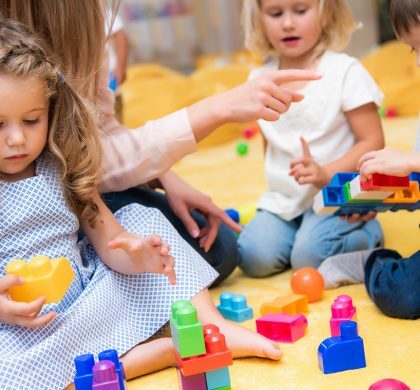 Auditory processing and receptive language often go hand-in-hand because students can’t comprehend or understand instructions that are given to them by parents or teachers. Children who used music therapy in combination with movement therapy at our center show the greatest amount of progress in their auditory processing and receptive language. If you think your child struggles with receptive or expressive language, seek the advice of a professional. There are many resources and tools professionals can use to help your child’s language development. If you would like to further develop your child’s speech and language skills at home, click here for a few toys and resources to strengthen their developmental milestones. To access the checklist of items above for your child or student’s language development, complete the information below. 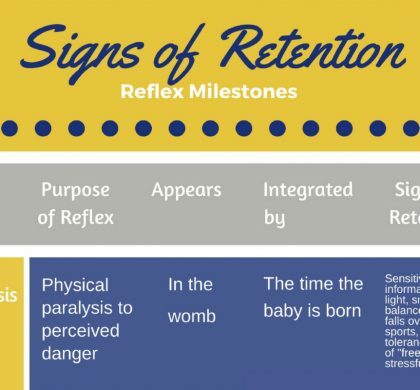 RED FLAGS: Are these Warning Signs and Red Flags Telling Me My Child may have a Retained Primitive Reflex Delaying their Learning Development?